Mayfair Art Weekend 2018 Programme Announced! – Art, Food, Travel and Fashion! 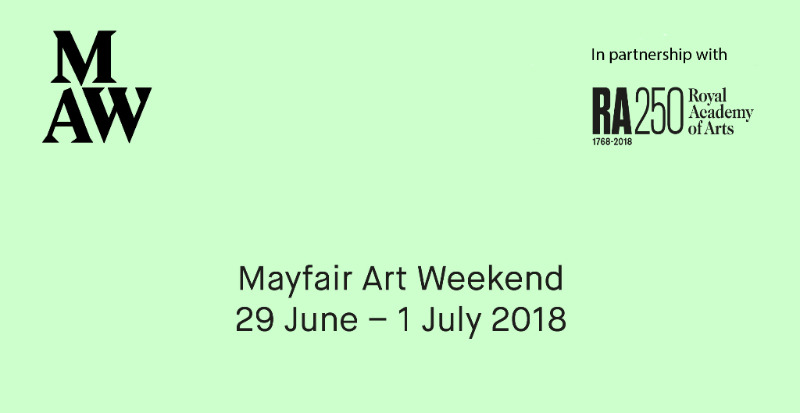 Mayfair Art Weekend 2018 Programme Announced! Mayfair Art Weekend (29 June – 1 July 2018), in partnership with the ​Royal Academy of Arts, will present an extensive programme of exhibitions, events, talks and tours across Mayfair & St James’s. Mayfair Art Weekend celebrates the diverse offering of this historic cultural district, internationally renowned as a vibrant hub of creativity and craftsmanship, where the worlds of art, fashion and luxury converge. Over 40 galleries, including David Zwirner, Gagosian, Galerie Thaddaeus Ropac and Hauser + Wirth, will participate in this year’s Mayfair Art Weekend. New galleries for 2018 include Cardi Gallery, Christie’s, kamel mennour, Mall Galleries, Mimosa House, Olivier Malingue, Peter Harrington Rare Books, Richard Saltoun and Senesi Contemporanea. The Gallery HOP! will launch the weekend with 24 galleries hosting special evening viewings and events from 6-8pm on Friday 29 June with drinks sponsor Sipsmith Gin. Lévy Gorvy gallery have invited London based DJ Cedric Bardawil to perform for their Gallery HOP! event, where he will play music in response to their exhibition featuring the works of artists Yves Klein and James Turrell. Exhibitions on view over the weekend include works by internationally acclaimed artists such as Richard Prince at Skarstedt Gallery – showing early ‘Joke Paintings’ previously unseen in the UK; Howard Hodgkin at Gagosian – an exhibition of the artist’s last paintings; Christo & Jeanne-Claude at Stern Pissarro Gallerypresenting preparatory works for some of their most important and iconic public works. This year’s programme has a strong showing of British artists, with over a third of the exhibitions on view including British names, which range from street artist Ben Eine to Victorian artist Sir Walter Sickert. Many participating galleries will shine a spotlight on female artists, with American installation artist Carol Bove at David Zwirner, contemporary video artist Tejal Shah at Mimosa House, and groups shows such as Land of Lads, Land of Lashes at Galerie Thaddaeus Ropac – showcasing sculptural works by three outstanding pioneers of Minimal and Post-Minimal Art – and Hypnagogia at Pippy Houldsworth Gallery – an exhibition of female artists whose paintings offer a distilled interpretation of reality. Creative partner, Max Mara will host a talk on Saturday 30 June, 11am, with Whitechapel Gallery director, Iwona Blazwick on the importance of supporting female artists and the history of the Max Mara Art Prize for Women.